In the global battle against cancer, the scientific community is looking into efficient solutions to effectively destroy cancer cells without harming healthy ones. A team of researchers from the University of Applied Sciences in Darmstadt (Germany), the Université de Lorraine (France) and the pharmaceutical corporation MERCK are developing new ways of separating cancerous from healthy blood cells. 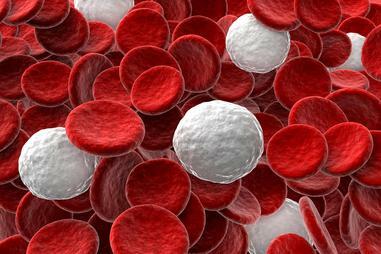 Leukaemia, a cancer that results in the over-production of white blood cells, is treated by drawing large amounts of blood, which are subsequently cleaned using filtering techniques and finally reinjected. Currently, the separation of cells is carried out by centrifugation or fluorescence activated cell sorting (FACS). An international team of scientists came to the ESRF to study another technique, called chromotographic filtering, which would preserve cells better than centrifugation and much faster than FACS. This technique consists of flowing a cell suspension through a porous medium, which is activated by an inner surface coating. This coating binds the specific cells (cancerous cells in the case of leukaemia) to the inner surface and, in this way, reduces their mobility. The coating is of utmost importance in this process, as is the geometry of the pore space of the foam. Partially open foams are good candidates to be used in this technique. The interest of these foams lies in their high porositiy and their large inner surface, which offers a huge number of possible cells’ sites. The technique is still in its developmental stages and, although promising, many question marks remain: the mechanism of the filtering, i.e. the effectiveness of the coating, the dynamics of the flow and the attractiveness of the cells’ sites are still not well understood. ID19 helped the scientists to delve inside the foam in an experiment reproducing the processes that take place in chromotographic filtering. On ID19 the researchers followed the cell paths in an alcoholic suspension pumped through pore space. The scientists imaged the cells in 3D using time-resolved microtomography, which needs high-spatial and temporal resolution as well as sufficient contrast between the cells, the suspension and the solid matter of the foam. This is why the team used phase-contrast microtomography at beamline ID19 was chosen, i.e. the only suitable beamline which combines high imaging sensitivity with short acquisition times and high spatial resolution. The results showed that the shape of the inner surface of the foam has a considerable impact on the particle paths. The level of torsion of the surface is much smaller for slow cells moving close to the surface compared to that of fast cells, which underlines the importance of torsion for filter efficiency “These results are very promising, and they leave us a step closer to using this technique in the future”, explains Professor Joachim Ohser, researcher at the University of Darmstadt and associated with MERCK. “The proof is that a pharmaceutical company like MERCK is supporting and sponsoring this research. Blankenburg, C. et al, Journal of Microscopy, May 2017.